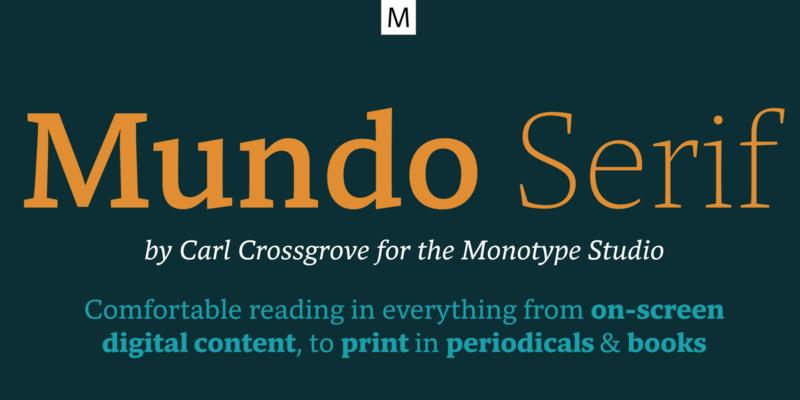 Mundo Serif is a contemporary typeface created by Carl Crossgrove and published by Monotype .Designed to be readable at any size, Mundo Serif is versatile and matches a wide selection of design contexts from traditional publishing formats to digital screens. Equipped with a set of classic design traits with influences of modernist typeface design, Mundo Serif’s primary goal is to facilitate legibility by means of the characteristics in its letterforms. The generous set of typographic features (stroke modulation, generous counters, commanding x-height and tall ascenders) works well in a variety of design projects. Due to the humanist qualities of serifs it can be used to add a warm and serious feel to your ideas. It includes nine weights, captions, subheads, pull quotes which make it ideal for uses where the text is dynamic or subject to change. In order to ensure on-screen legibility, Mundo Serif allows the designer to choose the right inter-character spacing, the variations in stroke weight and adjust the letterforms so they’re balanced and beautiful. When combined with Mundo Sans font, they create a sense of visual harmony while maintaining a sense of readability. Both fonts provide a character set that contains support for most Central European and Eastern European languages. As a serif font, with bold personality, this typeface reflects the stability and professionalism of the message it is communicating. A font description published on Wednesday, April 10th, 2019 in Carl Crossgrove, Fonts, Monotype by Iulia that has 254 views.